Inej is a member of the Dregs, a tough crew in a tough city. Inej is known as the Wraith because of her ability to scale walls and get into any place without being seen or heard. The Dregs' leader is Kaz, a ruthless, wily opportunist. With his reputation, Kaz is the natural choice for an impossible mission. Someone has developed a new drug that severely amplifies the magical powers of the Grisha, making them nearly unstoppable but leaving them so addicted to the drug they are completely dependent on their new master. Kaz agrees to somehow break into an impenetrable prison to kidnap the man responsible for making the drug. He assembles a crew of six, including Inej, to complete the task. Naturally things do go entirely as planned even without the threat of members of the team killing each other. When I learned that Leigh Bardugo had another book coming out I gave a little shriek and immediately began searching for a digital ARC of it so I could begin reading it right away. When that didn't pan out, I just put in my order for it so at least it would arrive on the day of publication. All because Shadow and Bone is one of my all-time favorites. 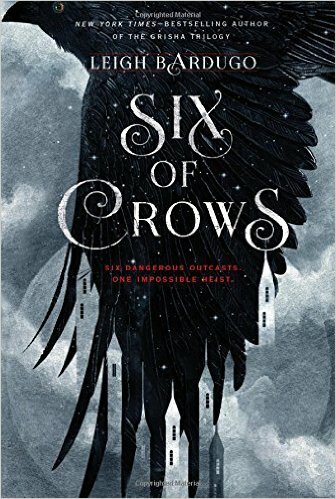 Even better, Six of Crows is set in the same universe. However, perhaps it was the build up but I didn't love this anywhere near as much as Shadow and Bone and I have a hard time believing that teens are going to stick with it as well. There is little action for most of the book and lots of character development. When the group does get to the castle and things begin going awry while Kaz seems to always be a step ahead, the story sizzles but the lead up is pretty darn long. Also, Bardugo drops you right into this world with the explanations of certain things coming a chapter or two later. That's why it's a challenging book and I often like a challenging book, but it felt like it might be a little unfair to teens. Still a very good book, but not as all out enjoyable for me as her previous works.